I added a few things and changed the process slightly from this recipe here – Kung Po Cauliflower and the author kindly agreed for me to include it in my blog. Some people will think “where is the meat” but this is a really filling dish and you will not be left hungry! One medium cauliflower will feed 2 people so it is also a very thrify recipe! 1 – 2 red chillies, seeds in, finely chopped – depending on how hot you like it! 1 green pepper diced very finely. Make the cooking oil by placing a wok over a high heat and adding the oil. When it is hot add the star anise, Szechuan peppercorns and the chilli flakes and stir . cook for thirty seconds then remove from the heat. Sir in the sesame oil and leave to cool then strain over a fine sieve. Par boil the cauliflower for 10 minutes in salted water and then leave to cool and pat dry. To make the marinade mix together the soy sauce, rice wine and syrup. Add the dry cauliflower to the marinade and set aside for at least 30 minutes. Put another half a teaspoon of sezchuan pepercorns in a dry pan and toast for around 30 minutes until fragrant and then cook and bash in a pestle and mortar but leave quite coarse. Set aside for later. Re-heat the wok over a high heat and pour in half of the prepared oil. When it is hot, lift out the cauliflower florets from the marinade and roll them one by one in cornflour until they are fully coated. Make sure you keep the leftover marinade to one side as this will make your sauce. Fry the florets in the oil , stirring and turning until they are evenly browned and crispy, about 2-3 minutes. Do this in batches or the florets will all stick together and go soggy instead of crisp as the oil temeprature will go too low. Add a little more oil between batches if required, but make sure you save 2 tablespoons. Place the cauliflower florets on kitchen towel to soak up the excess oil. Clean the wok and then add the rest of the oil. Add the chilli, garlic, ginger and green peppers and stir fry for 30 seconds over a high heat then add the chopped spring onion and the toasted and bashed szechuan peppercorns. 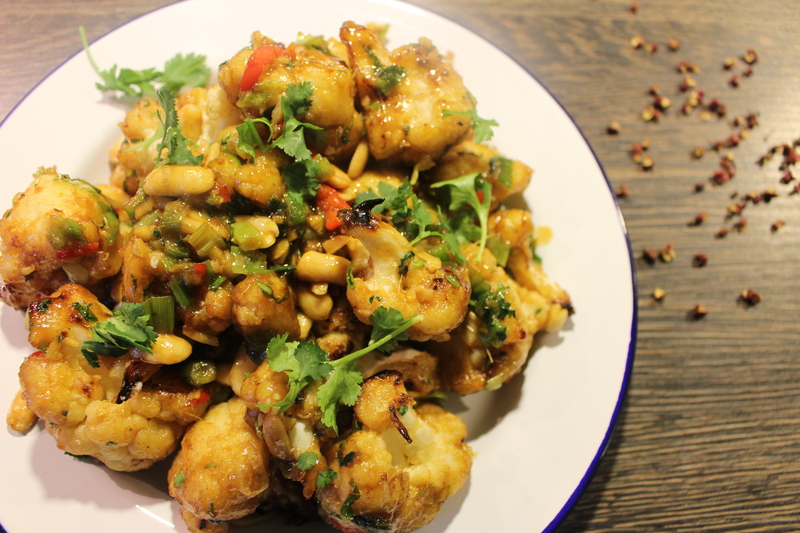 Fry for a few minutes and then add the crispy cauliflower pices, peanuts and most of the coriander, fry for 30 seconds then add the left over marinade. Cook for one minute tossing the wok to make sure that the cauliflower is coated with sauce. Serve with boiled rice and garnsh with the rest of the corriander. Dont be alarmed if your tongue feels a bit numb! This is the Szechuan peppercorns! Be carefull not to over season with salt (as I did) as the soy sauce in the marinade is salty enough!